HIS 4. Mongol influence led to unified states in China and Korea, but the Mongol failure to conquer Japan allowed a feudal system to persist. I can explain how the Germanic Invasions helped break up the Roman Empire. I can describe how invasions set the stage for the development of feudal and manorial systems in Western Europe. Notes 1 - Playposit Video Activity: Middle Ages . Watch this video for a short summary and explanation of the Middle Ages and Western Europe during this time period. ​Use the reading to finish your notes on early Middle Ages Europe. This reading focuses on Government and the Catholic Church. Charlemagne was the one of the most powerful and influential kings to rule during the early Middle Ages. For a brief period of time he was able to bring some stability, education and culture back to Europe. It would not last though! 1.Charlemagne was the king of the Franks. 2.He began his rule in the year 768. 3.Charlemagne expanded his territory by conquering smaller kingdoms in Western Europe. ​Then complete the Tic Tac Toe with words activity on the back of the notes sheet. You will need to go to the basket to get a set of cards and follow the directions there! Extras - Medieval Trivia !!! If you have finished your Charlemagne Notes and Activities you can do the following. 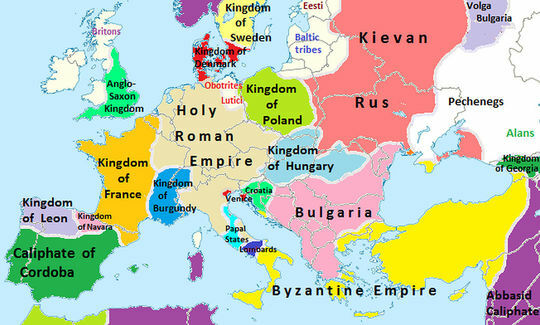 Europe before the rule of Charlemagne - 600 A.D.
​This is roughly what the borders in Europe looked like before the rule of Charlemagne. ​This map shows the extent of Charlemagne's empire by the time he died in 814. After Charlemagne's death, his empire was divided up by his heirs into 3 sections in the Treaty of Verdun. This would eventually lead to the development of France and Germany. Directions - Use the Activities below to fill in your Notes Sheet about the VIKINGS!! Follow the directions on the presentation to fill in your notes sheet activities. You MUST complete the edcite assignment in order to fill in the final part of your notes sheet. ​The information you will fill in on the chart is part of the very last question. View the Playposit to learn more about the Vikings from John Green. Answer the questions on the Playposit for classwork and a signature! You can miss only 1 so really pay attention! What do we know about Vikings? For Fun - Videos and Games! How the Vikings navigated at sea!